Amazing doctor, my daughter 7 years old did her first milky tooth filling, doctor made it easy for her and afterthe filling by few hours she was able to eat without any pain! Amazing doctor, my daughter 7 years old did her first milky tooth filling, doctor made it easy for her and after the filling by few hours she was able to eatwithout any pain! I'm happy with my visit, the doctor was very professional and explained everything very clearly, and all members of the staffwere very friendly. I felt very well taken care of. I'm happy with my visit, the doctor was very professional and explained everything very clearly, and all members of the staff were very friendly. I felt very well taken care of. 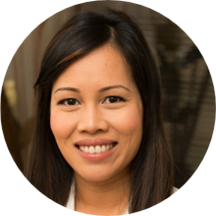 Dr. Katrina Le was awarded high honors and received her Doctorate of Dental Surgery from the University of the Pacific's Arthur A. Dugoni School of Dentistry in San Francisco. She continued to receive postgraduate training at UOP School of Dentistry in areas of cosmetic dentistry, root canal therapy, implant dentistry and invisalign orthodontics. One of Dr. Le areas of specialty is smile makeover using minimally invasive porcelain veneer. Dr. Le practiced in Silicon Valley for many years and was a prominent member of her community. She participated in projects that brought dental service and awareness to the underserved, such as the Chinatown Health Fair and Project Homeless, Give kids a Smile, and Global Dental Relief Dr. Le takes pride in her work and is very patient and gentle. She currently live in Cupertino/San Jose area with her husband, 2 year old son and her dog Mocha. This dentist visit is extremely disappointing - 1. The dentist listed Cigna DPPO Advantage as in-network, until I received bill and called Cigna, I was told she is out-of-network. 2. I indicated clearly in check-in form before visit that myreason for visit was "teeth cleaning". When I entered the office, even before seeing the dentist, the nurse practitioner started to set up the x-ray for me. I asked why and how many x-rays? She told me dentist needed it to exam my teeth first, and she was going to take 16 x-rays!!! 3. There was nothing about insurance coverage communicated during the whole visit, until I received a bill one week later - I have to pay 20% of each item including oral exam, 6 x-rays, and adult cleaning. While my dental insurance card indicates - Diagnostic and Preventive NO charge. 4. Before I leave for the 1st visit, they really make sure I set up 2nd visit to fix 6 cavities she found out, and told me I need night-guard etc. I have seen dentist many times before, almost always told my tooth were healthy, never heard so many issues before! 5. I called into the office about the bill, the lady just repeated herself again and again - "this is what we received from your insurance, and it is your responsibility to pay the bill", not helpful at all. Probably the best dentist I have ever gone to! Extremely sensitive and careful with the cleaning, incredible bedside manner and great advice! Wonderful visit overall. Doctor Le is very patient and nice. Since my English is not very good, she speaks slowly to make sure I understand everything. And her teeth cleaning is gentle. Katrina and her staff did an amazing job! I usually don't go too often to the dentist due to a traumatic experience some years ago. After seeing her, however, I have changed my routine and am much more comfortable with the idea of periodic cleanings. visit was scheduled for 2 hours later than the original appointment time, which was fine with me. Weekend hours are very convenient and the staff was friendly and helpful! Excellent consultation and dental hygienist Diana! Very comprehensive and friendly. Strongly recommend this doctor. Went ahead and made an appointment for my husband. I've gone here twice now and been very happy both times. Both the doctors and the staff are excellent. They're quick, kind, courteous, and knowledgeable, and it really feels like they take care of everything for you. They remind me whenmy cleanings are due, and make booking the appointments fast and almost automatic. Couldn't ask for more. Excellent service as always with Dr.Katrina Le. Katrina and other doctors were very nice and professional. I was very happy with both the dentist and the staff. Would definitely recommend. Awful experience. Outdated dental equipment, horrible techniques. They put you at a 90 degree angle when cleaning your teeth, blood rushes to your head so you come out with an huge headache. They didn't completely floss my teeth, skipped aroundmy jaw. I never write reviews but this place couldn't be worse. Only plus is they have weekend hours. Don't walk, run away. Nice and friendly environment. Get very comfortable examination and cleaning. Kind, attentive and helpful, can't recommend Dr Le enough! I really enjoyed Katrina Le as a dentist. The staff was very "efficient" with bad bedside manner... My teeth weren't appropriately flossed, my mouth kept being jabbed and cut from them forcefully taking my x-rays. Also, never in my life haveI ever been asked to hold the x-ray machine while its shooting my x-rays... It was bad manners. But they were nice people, just not the best bedside manner.. I enjoyed it as much as I could possibly enjoy a prep visit for a root canal. Everyone was really nice and they gave me cool sunglasses while I was getting my teeth drilled. Thoughtful. Walked me through every part of the appointment. She did a fantastic job and even stuck around late so that I could get some work done before leaving town for a few weeks. If getting a filling could be considered a pleasurable experience, she'd be the dentist to deliver it. Super sweet front staff and very helpful dentist. Wonderful dentist, and the office staff were very kind and friendly. Very helpful when my insurance company needed to be prodded and worked with me to resolve the issues. I would definitely recommend Dr. Le to all my friends in this area! Excellent bedside manners, great attitude towards new patients, and explains the potential treatment options very clearly to patients. Quick, friendly and quality work. Dr. Le is gentle, kind, knowledgable and comforting. I get nervous at the dentist and I felt comfortable from the moment I met her. She answered all my questions with a smile. Overall the office is open and honest about everyprocedure performed. I look forward to my next visit. Thank you Alliance Dental Team! Very friendly staff and no-nonsense professionalism. Highly recommended! Very friendly and professional staff! I will definitely be continuing to come here for my dental needs. The entire staff was friendly and professional. Highly recommended. Everyone at the office was very nice, Katrina included. She was also very patient and honest. Great experience! Friendly and caring staff. Dr. Le was super nice and helpful, and I was surprised that she actually did the cleaning instead of a hygienist. I'm not sure the hygienist really knew what she was doing though. She kept looking away while operating a polisher in my mouth, and polish my lips several times. It was a great visit! Everyone was very friendly! Sue and Dr. Katrina le are awesome! Amazing! If you are looking for a professional who cares and take time to explain your situation, don't look any further. I felt like I was in good hands. And everything was explained to me very clearly. I would highly recommend Dr. Le. She was very professional and explained everything clearly. What I liked the most was that she informed me beforehand how long the procedure would take so you know what to expect time-wise. Office staff was excellent and clearly explained any charges. Excellent dental work. Katrina is good professional, but the secretary lacks of skills. When I arrived, she was on the phone for almost 10 minutes talking with a person. During the time I was talking with her, the phone rang 4 times, andshe let me waiting. The secretary also lack of organizational skills because she was not able to find time for my next appointment. Also Katrina called and changed my appointment. Service is excellent and the advices about what would be best for my teeth is superb. Katrina and her staff were friendly and efficient. We'll definitely continue going to Katrina. Really great, very thorough. Administrative stuff was a little funny, but the medical part was especially great.